James L. Pray is a member of BrownWinick and the Chair of both the Environmental Law practice group and the Energy Law practice group. Jim’s practice includes both consulting and litigation services to the business community with an emphasis on assisting with environmental, railroad, utility, due diligence and business workout concerns. Jim has been involved with numerous environmental investigations cleanups around the state of Iowa and the rest of the country. 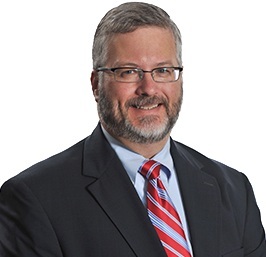 His practice includes assisting with contract negotiation, risk assessments, commercial development feasibility studies, brownfields projects, and mergers and acquisitions. Jim has also provided due diligence, development, environmental and transportation advice to more than three dozen ethanol and biofuel projects around the country. Jim’s litigation practice includes administrative litigation and civil litigation at the district court level, before the Iowa Supreme Court and the Court of Appeals for the Eighth and Sixth Circuits. Jim’s experience includes conducting hearings before administrative agencies, such as the Iowa Department of Transportation and the Iowa Department of Natural Resources, conducting jury and bench trials in the Iowa District Courts and United States District Courts in both the Northern and Southern Districts of Iowa and arguing appeals before both the Iowa Supreme Court and the Iowa Court of Appeals. Much of his practice involves representing businesses in disputes with governmental agencies, including the Iowa Department of Natural Resources, the Iowa Department of Transportation, the Surface Transportation Board, Federal Railroad Administration, the Agriculture and Land Stewardship Agency, the Iowa Utilities Board, the United States Environmental Protection Agency and the United States Office of Surface Mining. Jim is past two-time Chair of the Iowa Bar Association’s Environmental and Natural Resources Law Section and has also served as Chair of that Section’s DNR Procedural Rules Revision Committee. Jim has also served as Chair of the Administrative Law Section of the Iowa Bar Association. He was also a member of The Iowa State Bar Association’s Task Force on Administrative Law, which prepared an extensive redraft of Iowa’s administrative laws. Since 2006, Jim has been selected for inclusion in The Best Lawyers in America for environmental law.